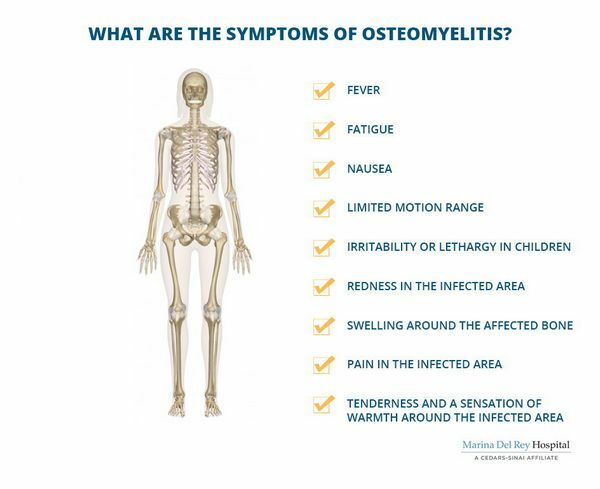 Osteomyelitis is divided into two subcategories based on the acuity of onset. Acute osteomyelitis, more commonly seen in children, is associated with sudden onset of bony pain, fever, and malaise. Acute disease is often the result of seeding of the bone during S aureus bacteremia, with the most common anatomic locations corresponding to highly vascularized osseous areas such as the metaphyses of long bones. Chronic osteomyelitis is a more indolent process, characterized by low-grade fevers and chronic nonhealing ulcers or draining sinus tracts in the skin overlying the infected bone. Bony necrosis is pathognomonic for chronic osteomyelitis. Chronic osteomyelitis commonly affects the feet and lower extremities and is often preceded by minor injury or surgery of tissues adjacent to the affected bone. Individuals with impaired vascular perfusion, such as diabetics, are at a particularly high risk for chronic bone infections. The laboratory findings are nonspecific and include an elevated WBC count and erythrocyte sedimentation rate. Blood cultures may be positive in acute osteomyelitis. Advances in imaging technology have improved the ability to diagnose osteomyelitis. Plain films are of limited use for acute osteomyelitis, as bony abnormalities are not detectable until at least 10 days after the onset of symptoms. Both the MRI scan and the technetium bone scan have increased sensitivity for detecting early osteomyelitis. The technetium scan uses a radiolabeled isotope, which localizes to areas of osseous regeneration. This technique is limited by the difficulty in differentiating bony regeneration due to injury from that due to infection. Another imaging modality, the indium scan, involves the venous injection of radiolabeled autologous WBC, which localize to sites of granulocyte aggregation in infected bone. The clinical utility of the indium scan is limited by poor discrimination of osteomyelitis from simple cellulitis and low sensitivity for diagnosing the chronic form of osteomyelitis. Bacteremia caused by osteomyelitis may lead to secondary end-organ infections. More commonly osteomyelitis causes extensive local bony destruction. Patients with peripheral vascular disease, particularly diabetics, may require surgical revascularization to cure osteomyelitis of the lower extremities. In situations where surgical revascularization is not an option or has failed, localized amputation may be necessary. Because of the need for prolonged antibiotic therapy with osteomyelitis, a concerted effort to obtain a microbiologic diagnosis before initiating therapy should be made. Culture of cutaneous sinus tracts has an unacceptably low sensitivity and specificity and is not recommended for diagnostic purposes. All patients should have a surgical bone biopsy, as this is the only reliable way of obtaining adequate culture results to guide therapy. The treatment of osteomyelitis presents a particular challenge as antibiotics penetrate bone poorly; antibiotic concentrations in bone are only 5% that of serum. All successful treatment regimens require high dosing for prolonged durations (Box 6). Standard regimens require intravenous therapy for 4-6 weeks. The requirement of multiple daily doses is impractical for outpatient administration and has led to increasing interest in less complicated regimens. Treatment with parenteral antibiotics followed by oral therapy in children achieves cure rates equivalent to those of standard parenteral regimens but has not been studied sufficiently in adults to make recommendations regarding oral antibiotics for this age group. Surgical debridement is required for chronic osteomyelitis, particularly in the presence of necrotic bone or sequestrum. Patients with chronic osteomyelitis should receive at least 6 weeks of parenteral therapy after surgical debridement. Infections in patients who are unable to tolerate surgery or who have refractory disease can be suppressed with ciprofloxacin (750 mg orally twice daily) and rifampin (600 mg orally each day), given indefinitely.